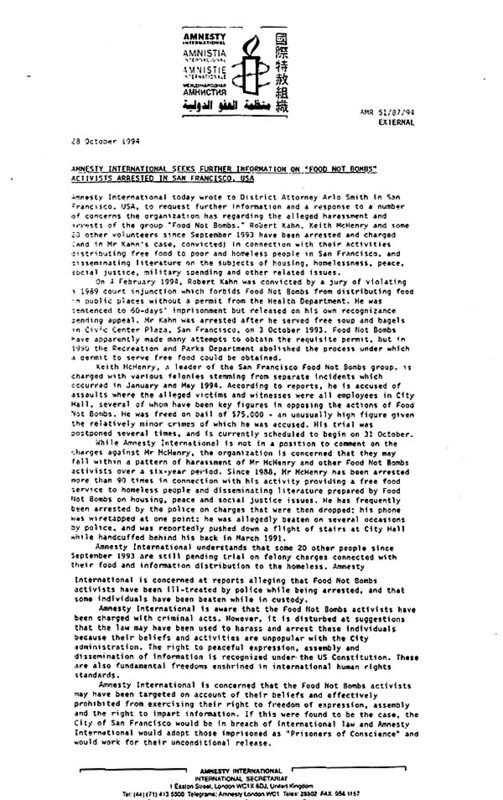 A letter from Amnesty International during our 1994 campaign in San Francisco. This is one of many letters Amnesty International sent to support Food Not Bombs in San Francisco. Amnesty International also came to the aid of Food Not Bombs volunteers in Mexico and Asia. Food Not Bombs co-founder Keith McHenry is free today in part because of the work of Amnesty International chapters on campuses all over the world. Keith is happy to speak to your classmates about how important Amnesty International is to those seeking to improve our world.